Vietnam is enticing more and more international investors lately and, in a recent survey by the Association of Foreign Investors in Real Estate (AFIRE), Vietnam ranked fourth in the world in the emerging global real estate markets category. The AFIRE survey was a poll of a group of investors who hold more than $627 billion of global real estate in assets collectively. The results showed that Brazil, China and India dominate the emerging real estate markets for investment, but Vietnam, unranked in 2010, jumped straight into the world top five, taking fourth position. Among the emerging markets, Brazil took first place from China in second, which ranked top in 2010. India came in third, Vietnam fourth and Mexico ranked fifth, losing last year’s position to Vietnam. Russia, which has been amongst the top five emerging real estate markets for the last two years, dropped to tenth place. Peter Ryder, general director of Indochina Capital, which currently has several real estate projects under construction in Vietnam, commented on the recent rise in investment saying; "This result is due to the rapid growth of Vietnam's real estate market and the open regulations, which allow the participation of foreign investors." Currently Indochina Capital is developing the Indochina Hanoi Plaza, a retail complex worth $160 million, and the Da Nang Hyatt Regency, worth an estimated $130 million. Both projects will be completed by the second half of this year. 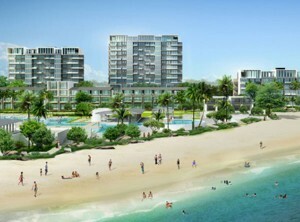 The group also plans to launch a new development project in Nha Be District, Ho Chi Minh City called the Saigon South. This project will provide over one thousand apartments for Vietnam’s middle-income earners. Vietnam continues to appear attractive to foreign investors and its economy has recovered well from the global recession. Other factors enticing overseas investors to Vietnam are its strong economic growth, fast rate of urbanisation and the growth of its new middle class.